A thin membrane that consists largely of blood vessels that nourishes the outer part of the retina. It is the most posterior part of the vascular coat (sheet) of the eye and is located between the sclera and the retina. It is difficult to estimate the thickness of the choroid because of the numerous vessels. It is thickest in the macular area, posteriorly (about 0.22 mm) and thinnest anteriorly (about 0.1 mm) near the ora serrata where it ends along with the retina. A thin circular disc that gives our eyes their “color” and acts like the diaphragm of a camera. It is perforated near its center by a circular aperture called the pupil. The pupil varies greatly in size under different levels of light. It regulates the amount of light which reaches the retina by constricting in bright light and dilating in dim light. It also constricts duringPupil and Iris diagram of the eye from Master Eye Associates eye doctors resized 600 accommodation (focusing for near vision) to sharpen the focus by diminishing spherical aberration. Eye color is controlled by the amount of pigment deposited in the layers of the iris. Blue eyes have less pigment deposited and brown eyes have more pigment in the iris. It is true that most babies of the white race are born with blue eyes. As time goes on in an infant’s eyes the pigment can change. The center opening or circular aperture of the iris that appears black when viewing one’s eyes. The pupil enlarges when a person is in dim light and constricts (gets smaller) in bright light. Pupil reflexes are checked by doctors to assess certain neurological conditions. Eye doctors often dilate the pupil using medical eye drops so they can get a better and larger view of the retina, especially the peripheral retina. The main blood vessel that carries blood away from the eye. Veins appear darker and wider than arteries when viewed by special ophthalmic instruments (e.g. ophthalmoscopes) looking into the eyes. The thin transparent tissue overlying the sclera which continues over the posterior part of the upper and lower lids. Containing the most immunocytes of all the anterior eye structures, it serves as a protective layer against allergens and infective agents. The conjunctiva can be broken down into its three structurally separate parts: the palpebral conjunctiva lines the internal eyelids, the bulbar conjunctiva lines the sclera, and the fornix connects the latter two forming a cul-de-sac portion. An inflammation or infection of the conjunctiva is called conjunctivitis. Muscle which functions to control accommodation of the lens. It is connected to the lens by zonular fibers. When focusing fine detail up close, the ciliary body contracts, the zonular fibers relax causing the lens to become more convex. This creates a built-in zoom lens allowing the eyes to change focal power from far to near. As humans age the crystalline lens of the eye hardens and loses its elasticity. This makes it increasingly difficult to change the shape of the lens. By about the age of eye anatomy Master Eye Associates45 most people have lost some ability to change focal power from far vision to near vision because of this hardening of the lens. This condition is called presbyopia and worsens even further until all ability to focus at near is lost unless a person is myopic and can remove their optical prescription and see at near. The epithelium of the ciliary body secretes aqueous fluid (see section below) into the anterior chamber of the eye. If the ciliary body creates too much aqueous or if not enough aqueous filters out of the eye, then the pressue within the eye can increase, which can cause damage to the optic nerve and the nerve fiber layer of the retina. This condition is called primary open angle glaucoma. Fluid that bathes structures in the anterior 1/3 of the eye. This fluid is derived from the blood vessels in the ciliary body processes and through a circulatory recycling process flows from the posterior chamber into the anterior chamber. Eventually it returns to the blood system draining out through structures including the Canal of Schlemm. Some glaucoma medicine is designed to reduce the formation of new aqueous fluid to help decrease the pressure inside the eye. Most glaucoma eye drop medicine increases the ability of the eye to filter more aqueous fluid out to the blood stream through Sclemm's Canal (see below). A vascular structure which spans the circumference of the anterior chamber and functions to return aqueous humor back to the general blood circulation of the body. A term used to describe the area outlined anteriorly by the corneal endothelium (back surface of the cornea) and posteriorly by the crystalline lens. Aqueous fluid circulates throughout the anterior chamber. A term used to describe the area outline anteriorly by the crystalline lens and posteriorly by the vitreous gel. The anterior clear part of the eye. It is the first clear “window” through which the light enters the eye. The transparency of the cornea is important in order for vision to be clear. Though it has many functions, one of the most important is to bend (refract) light entering the eye toward the lens, which in turn additionally focuses the light to the retina. The cornea also has a protective function. The cornea is composed of five layers each providing a detailed function for this special tissue in the eye. The cornea is a very unique tissue because it is avascular (no blood vessels) within the tissue and because it must remain totally clear for proper functioning and best vision. Disorders of the cornea include keratitis/corneal ulcer (infection), keratoconus, pellucid marginal degeneration, astigmatism and many different types of corneal dystrophy. This is a biconvex structure located between the pupil and vitreous. It acts as the second “clear” window of the eye. The lens differs from theCrystalline Lens and Cataract Master Eye Austin cornea in that it has the ability to change shape in order to focus images at varying distances (accommodate) becoming shorter and fatter for near vision (more convex) and thin and long for far vision. A cloudiness or opacity of the lens is called a cataract. The gel-like material of the posterior eye. As we age the vitreous becomes more liquid-like and shrinks. It consists of water, collagen, hyaluronic acid and various proteins. During early eye development, the vitreous forms attachments with surrounding ocular structures: optic nerve, the fovea, the posterior lens surface, and the ora serrata. The strongest attachment is at the ora serrata. The vitreous is the site of vitreous floaters. The peripheral edge of retinal attachment to the ciliary body. This area marks the outer limits of perceptible retina. The ora is less developed and thinner than the central portion of the retina. It is also the location of the strongest attachment of vitreous base to retina and therefore is a common site for retinal detachments. The “white” part of the eye is actually a fibrous tunic which comprises the 5/6 of the eye’s outer coat. It functions to protect the intra-ocular structures and sustain the shape of the eye. Due to its fragile nature in younger children, it may have a “bluish” color. The sclera is penetrated by blood vessels and nerves, but the most important penetration is the optic nerve (see below). A thin multi-layered sensory tissue that lines the back of the eye. 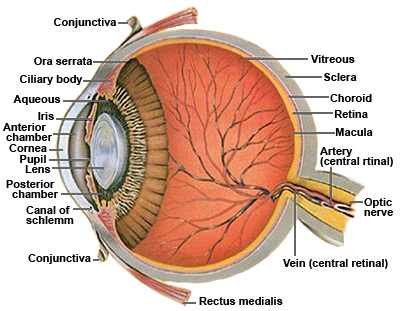 The retina contains two types of photoreceptors (neurons) called rods and cones. Visual information received by the photoreceptors is translated to neural signals by the nerves called ganglion cells. The rods are more abundant in the peripheral retina and work to detect light/dark changes as well as shape and movement. Cones detect color and distinguish fine detail which is why they are denser in the central retina, especially in the fovea. The retina is absolutely important to the function of the eye and is the site for many eye diseases and disorders such as macular degeneration, diabetic retinopathy and retinal detachments. This is the central part of the retina where cones are densely packed. 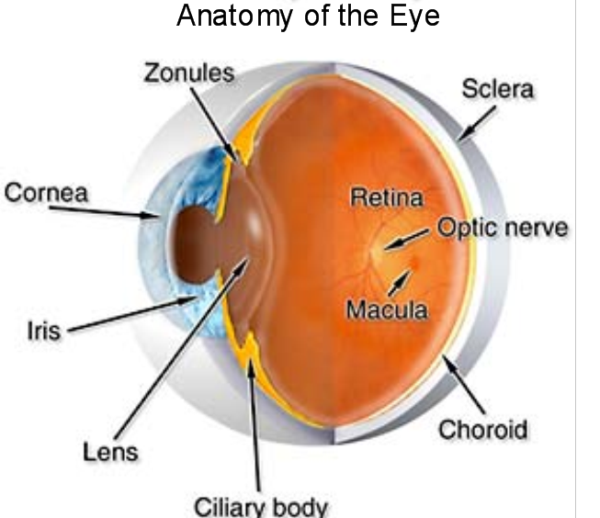 The fovea is the center part of the macula and is the part of our eyes that fixates when looking directly at an object. Macular Degeneration is the most common complication that occurs in the macula and is one of the leading causes of blindness. There are new treatments for wet (exudative) macular degeneration, the most devastating form of macular degeneration. Learn about the new treatments for macular degeneration. Often regarded as the most important part of the eye. Learn all about the fovea. Is the collective input of information from ganglion cells which are carrying information from the retinal photoreceptors. The optic nerve carries this information to the brain where the signals are interpreted allowing visual perception. Since it is devoid of any photoreceptors (i.e. rods and cones), the optic nerve corresponds with our natural blind spot. The optic nerve is the structure damaged by glaucoma which ultimately leads to blindness if not treated properly. The artery which supplies blood to most of the cells of the neural retina. One of the six extraocular muscles. The rectus medialis is located on the medial side of the eye and works to adduct (turn inward) the eyes. an important meshwork of connective tissue that surrounds the base of the cornea and iris and functions to drain aqueous humour fluid from the anterior chamber of the eye into Schlemm’s Canal and ultimately into the blood stream. The trabecular meshwork typically does not function properly in patients with glaucoma, thereby causing increased pressure in the eye as fluid builds up due to the poor drainage.